YOU CAN spend years toiling in obscurity, hoping for a shot at the big time. Then, one day, someone taps your shoulder, and suddenly it's time to show the world what you're made of. 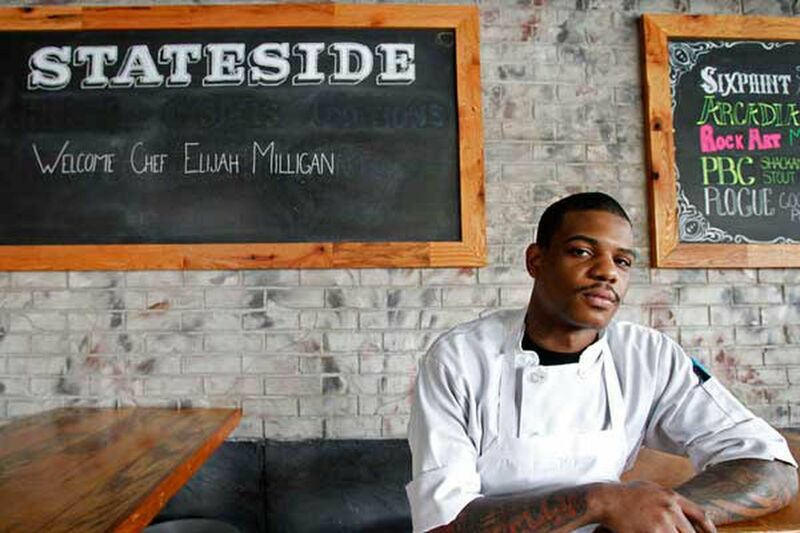 That happened to Elijah Milligan earlier this month when he was named executive chef at Stateside, on East Passyunk Avenue. Just 24, he joins an exclusive club of executive chefs at standout restaurants in our city's lauded food scene. Milligan replaced hotshot George Sabatino, who had guided the now 2-year-old Stateside from obscure neighborhood spot to best restaurant in the city, according to Philadelphia magazine. Stateside also was one of the places that Anthony Bourdain visited when he was here last year filming his Travel Channel show "The Layover." "To fill those [Sabatino's] shoes, we interviewed 15 people, and none of them really fit until we met Elijah," said Kema Fortunato, manager at Stateside, which specializes in American food and spirits. "We thought he was the perfect fit." Milligan has been cooking on all burners ever since, tweaking the restaurant's menu and stocking the kitchen his way. The day I caught up with him last week, he had pulled an all-nighter at the restaurant, smoking homemade chili sausages and making a pistachio sauce for a cider-brined duck dish. When he does go home, it's to Olney, where he lives with his girlfriend and their 2-year-old daughter. I took a peek at an early version of the new menu, and let me be among the first to report that it's an adventurous mix of small plates - oysters on the half-shell with mignonette sauces that vary by day, and a seared foie gras with French toast, bourbon caramel and a golden-raisin jam. My taste buds are aquiver imagining his carrot chiffon cake with blue-cheese icing. Milligan may be young, but he's no newbie, having spent the last decade working at Le Bec-Fin, Vernick Food & Drink, Bar Ferdinand, Parc and Distrito. Still, getting the executive chef job at Stateside is the career break of a lifetime. "I don't want to come off the bat and say we're just going to come out and do way better than what we did last year, but, of course, that's the goal, and that's what my guys are kind of hyped up to do," Milligan said. I asked him if he was nervous. After all, Stateside is buzzy right now. "[Georges] Perrier kind of beat the fear out of me," he said, referring to the fierce former chef/owner of Le Bec-Fin. "I've had opportunities to work for a lot of great restaurants, and a lot of great chefs. After a while, it kind of wears off. I just want to cook good food." Milligan, by the way, is African-American. I point that out only because there aren't many black chefs in high-end restaurants, not only in Philly but nationwide. "It's very rare for people to become executive chefs and far more rare for people of color to become executive chefs," said Saru Jayaraman, author of the restaurant-industry analysis Behind the Kitchen Door. Jayaraman also directs the Food Labor Research Center at the University of California. "I applaud [Milligan]," she said. "It's quite an accomplishment given the lack of mobility in the industry." Not that he dwells on it himself. "Most restaurants I've worked in, I've been the only black guy," Milligan said. "Things like that I kind of push to the back of my head. It's just something that I never put too much thought in." Milligan was just 14 when he got his start, at his stepfather's restaurant, Just to Serve You, between 56th and 57th streets on Girard Avenue. "When I opened my first restaurant, it was just him and me doing all the work," confirmed Nathaniel Fields, Milligan's stepfather. "At the beginning, that boy didn't want to touch a pot with some water in it. If I asked him to clean a chicken, he would look at me like, 'Are you serious?' "
Something turned around in him, though. One day, Milligan announced, " 'Pop, I figured out what I want to be,' " said Fields. "He said, 'I am going to be the best chef in the city of Philadelphia.' "
"A chef does more fine dining. I do soul food - fried chicken, turkey wings, shrimp, macaroni and cheese, collard greens, string beans. What he does is the total opposite. He started off doing soul food and took what he does to a whole other level." After graduating from Samuel S. Fels High School in 2006, Milligan enrolled at JNA Institute of Culinary Arts, on Broad Street near Federal, in South Philadelphia. He juggled classwork with part-time jobs at numerous restaurants - including Parc and Distrito. After graduation, his first full-time job was at the venerable Merion Cricket Club, in Haverford. Meanwhile, he was spending his days from 8 a.m. until 2 p.m. at Le Bec-Fin. Milligan was constantly on the go, but he loved his time at the renowned French restaurant. And Le Bec loved him back. Before long, Milligan was working there full time as the garde manger, specializing in cold dishes. "I learned all the things that I didn't have an opportunity to learn in school and I probably wouldn't have learned anywhere else, like charcuterie and terrine and paté-making - all of those classical dishes. [Perrier] kind of gave me a lot of recipes for that, and he spent a lot of one-on-one time with me. It was pretty cool." In 2012, after Le Bec-Fin briefly closed, Milligan became the meat and fish cook for Vernick Food & Drink, at 20th and Walnut. Eight months later, he moved on to a higher-paying gig as a sous chef at Bar Ferdinand, the tapas spot in Northern Liberties. That's where he met Fortunato, a part-time server who also tended bar at Stateside. "My last day serving [at Bar Ferdinand], before I became manager here, was his first day," Fortunato explained. "He put a special on the board. I think it was tuna ceviche or escabeche. It just blew my mind. It was the best food I'd had there in a long time. I was excited. I knew he had something." So when Stateside needed an executive chef, Fortunato knew who to call. Milligan was more than ready.